Olive bread recipe is a delicious healthy Greek way to enjoy lunch. Olive bread recipe is a bit time consuming made the old fashioned way of kneading by hand but easy with a home baking machine. I won't pretend that this is slow food, made fast; it isn't. Baking your own bread from basic principles is an indulgence, when you have a long, uncomplicated day ahead to luxuriate in; with a good book at hand to fill in the time whilst the yeast is doing its own thing. Just the aroma makes the effort worth your while. Perhaps it's because, as a chiropractor, I am kneading the whole day, that I love to bake bread the old fashioned way. These days I confess, with long hours spent writing my Bernard Preston books, I cheat and make my olive bread recipe the quick and easy way using a machine. Five minutes work and I have to admit it tastes just as good; and I have less failures, but not as much satisfaction. Our Panera bread recipe using the kitchen appliance is indeed slow food, made fast. I once had an elderly patient who taught me to bake the Mediterranean way. She has passed on at ninety-six, but every time I make a loaf, or get up an aubergine dish, she comes to life again. I cut my chiropractic teeth on her arthritic hip. An unset fracture, aged only twelve during an invasion of Lebanon, gave her a life time of hell, but she coped with grim determination and chiropractic care. I first discovered olive bread when I arrived late one evening at the bakery in the little Dutch village of Klimmen where we lived for three years. All our favourites were sold out, leaving only a tempting oily feeling loaf. It was expensive, I must confess, but what a delicious find. The ingredients of olive bread recipe are basics in your kitchen. The yeast mix for your olive bread recipe is made as follows. Place the warm water in a small bowl; stir in the honey, and then add the yeast, and cover and set aside in a warm spot for 15 minutes. Stir in 3 tablespoons of olive oil, 1 tablespoon of flour and 1 teaspoon of salt. Since butter is back you may want to chuck in a pat of good old fashioned cholesterol. There are now big questions being asked about the sanity of changing to polyunsaturated oils and margarine. Olive oil remains queen of course. The dough mix for your olive bread recipe is made as follows. 450 grams of finely ground wholewheat flour. Your bread is only as good as the flour you use. If you are going to do this regularly then I suggest you look at this healthy flour link; it's all about the causes of osteoporosis. Spending a lot of time and energy baking with crappy ingredients is like building a beautiful mansion on a poorly located piece of ground to my mind! 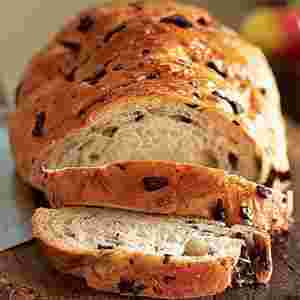 Olive bread recipe also describes a pate and a feta dip for your daily loaf. Measure out half the flour into a bowl, making a well in the centre and then adding the yeast mixture. Sift in the rest of the flour. Make it up into a ball of dough, and knead it on a floured wooden board for about ten minutes, rolling it in from the edges. Here's a little tip to get your dough right. Add the last of the flour gradually, making sure that the ball is not too dry. Cover the ball with a damp cloth, and place it in a warm spot such as a warmed oven, turned off; allow the dough to rise until it has doubled in size. It takes about two hours. Meanwhile, resist the temptation of your book for just a few more minutes get together. The onion and herb mix for your olive bread recipe is made as follows. 10 pitted black olives, rinsed in hot water, and dried on a paper towel, and finely chopped. 1 tablespoon of finely chopped rosemary. Lightly fry the onions in olive oil, and then add the chopped olives and rosemary. Now for that cup of tea and your book; for about an hour and a half. Once the dough has doubled in size, punch it down, add the onion mix, and lightly knead again for a minute or so. Grease a bread tin thoroughly with a butter wrapping or it will stick and add the dough. Again cover with your damp towel, and put it back into the slightly warm oven, still switched off, for an hour. If the sun has downed, invite the family for a glass of red wine, and make a start on your olive garden salad recipe. Actually, you don't really need to call them; the heavenly aroma will bring them down from upstairs within a few minutes. Hot air rises, hence the monsoons, as my grandmother used to say. After an hour, gently remove the dough from the oven taking care not to bump it. Preheat the oven to 190 degrees celsius. Place the dough back into the hot oven, reducing the temperature to 180. After ten minutes quickly brush the loaf with olive oil and return to the oven, baking until it's golden brown. About half an hour plus. Prick and see if it needs another fifteen minutes. Now, your patience, and your olive bread recipe, have finally come to fruition. If you are going to heat olive oil there is no point in using extra virgin oil. Neither do you need your special raw honey. These four dips will get your mouth watering. So easy to make...SLOW FOOD MADE FAST; fantastic on your olive bread recipe. 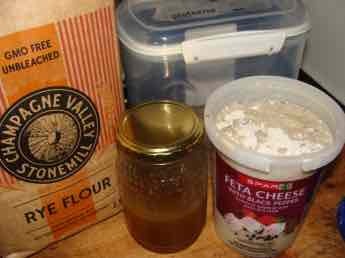 For your olive bread recipe you have to be precise obviously with the recipe, but with this olive paté and the feta dip, just chuck it in! Greeks and Italians by the way will turn up there noses at pitted olives. Pit the olives for your olive pate, and throw the ingredients into the blender for a few secs. Make sure there are NO pips! They'll destroy your blender, your teeth too! Add more olives or oil if you want it thicker or thinner. Sprinkle with a little oreganum. Feta cheese dip recipe can be made in a jiffy; it's magnificent with your olive bread recipe. If raw onion gives you indigestion, use a teaspoon rather, or even lightly fry it in the olive oil. A cup of feta cheese, lightly chopped. A couple TBSP of olive oil. One TBSP of chopped onion. A couple sprigs of parsley, stalk and all. Add more feta and less yoghurt if you want it thicker, so it doesn't dribble off your olive bread recipe. Tzatziki is just a cucumber and yoghurt dip that goes perfectly on your olive bread recipe. Follow the Feta dip recipe when making Tzatziki, and add a few slices of cucumber. A purist might squeeze the cucumber juice out, but that's where the nutrients are. Greeks would add more garlic, and perhaps not include the feta. Either way, it's wonderful on your olive bread recipe. Do your own thing, as the quantities are not important. A few feathers of anise would be nice. This cucumber dip is fantastic with your olive garden salad recipe. Hummus can be made in five minutes once you have the ingredients together; it goes naturally with any loaf, but especially this olive bread recipe. Choumi, also known as hummus is not difficult to make, but rather more preparation time is needed; an overnight soak of the chickpeas unless you want to cheat and use canned chickpeas. But after pressure cooking the chickpeas for twenty minutes, then it takes only four minutes to throw it together. It's delicious on your olive bread recipe. Into the search engine in the navigation bar, you can type in terms such as canned versus dried chickpeas. Is it worth the schlep? Cooking chickpeas is another that might interest you. Follow the Authentic Hummus Recipe below; hummus is second only to oats of the super foods for lowering the stroke causing blood cholesterol, without affecting the healthy blood cholesterol. The first three dips you can throw together in five mintutes, the hummus in four minutes. Like I said, soak a couple pounds of dried chick peas overnight, and then pressure cook them for twenty minutes. They freeze well by the way, so divide them into small packets and pop them into the deepfreeze. You don't have a pressure cooker? Get a stainless steel one; it's an exceptional time and energy saver. I wouldn't be without ours. Hey presto, as they say. Your hummus goes very deliciously with your olive bread recipe. 1 cup chickpeas, washed. Soak overnight. Discard the water. Boil one and half hours with ample fresh water until tender. Half a clove of garlic. Chop. A couple tablespoons of tahini, a sesame paste. A couple tablespoons of olive oil. A couple slices of lemon, pulp and all but minus the pips. Blend the ingredients together, and sprinkle a little parsley over it, and add another dribble of olive oil if you want it to look pretty. Never use whole sprigs of parsley as a garnish. People don't eat it, and it's probably about the healthiest ingredient on the plate. Chop it finely. A delicious gentle flavour. Some like it hot. Add a slither of anti inflammatory chili; good healthy stuff. Here's an interesting aside; if you suffer from generally aching joints and muscles start adding prodigious amounts of anti inflammatory foods to your cooking. Extra virgin olive oil and chilis are a good place to start. Call it Crosteti if you're Greek or want to show off! It's made from your olive bread recipe. Toast, or grill, a few slices of of your olive bread recipe and then sprinkle with olive oil and oregano. Cover with thinly sliced tomato and recipe basil pesto, or anchovies, or whatever and, hey presto, you have a delicious Greek meal. Serve immediately while still warm with one or more of the dips. Enjoy. PS. Absolutely do not use margarine on your Olive Bread. It contains hydrogenated foods. Why? Didn't you know, butter is back? Panera bread menu recipe using a bread machine is a delight. Whilst it's reputed to be the least used kitchen utensil, I use our Panasonic daily. It takes me no more that five minutes to measure out the dried yeast, flour, water, olive oil and seeds. Better still, it's powered by our solar powered generator. 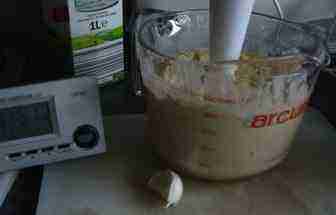 Adding a tablespoon of hummus turns it into a low GI bread, and greatly improves the taste and consistency. Making your own sourdough bread starter, loaded with yeasts and lactobacillus needed to make a healthy loaf actually is very simple. All you need is some rye flour and raw honey. In four days you'll be ready to bake your first loaf; add the onion and herb mix and you have a olive bread recipe. No web site on Mediterranean food is surely complete without a simple recipe for pickling olives, made in a jiffy. All you need is a can of olives, first washing off all the brine, vinegar, olive oil and a few of your favourite herbs and spices: garlic, perhaps chili, a slice or two of lemon or orange, dill and so on; for more details on pickling olives, so easy, follow the link below; careful if you much them with olive bread recipe; you may break a tooth on a pit. Fish soup goes delic with Olive bread.